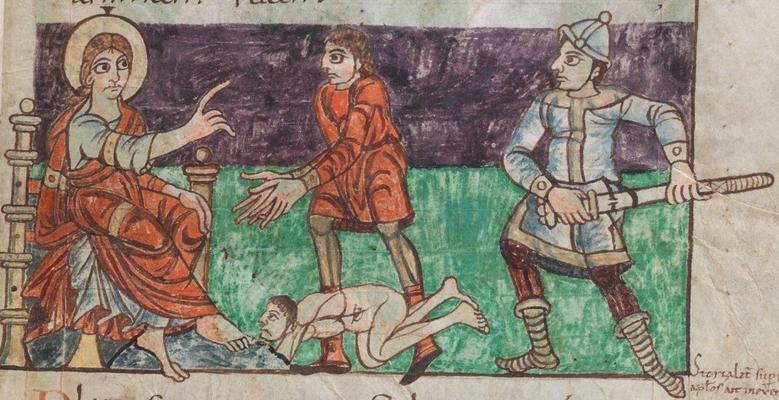 I'm looking specifically at a 950-1050 AD central and western European setting here, but I've been looking at Spanish, Ottonian and English manuscripts and sculpture, and while there seems to be some variety in suspension methods, it looks to me like belts with buckles and a wrap or hidden slide seem to be dominant. Most of the swords shown are on the hip, and are usually canted at a 30-45 degree angle, with no visible baldric. I have access to more images (including what I believe to be a green and brown parti-colored scabbard), but I'll just post a few that I can find at the moment. 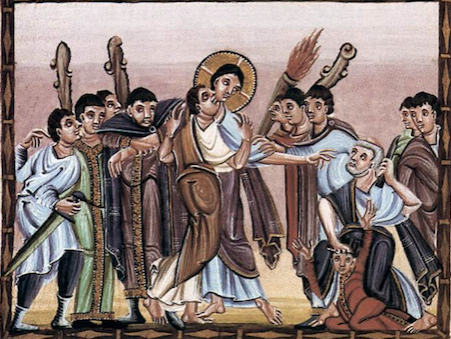 Do people think that the double scabbard straps shown in Carolingian art are still around? The split woven belt doesn't seem to be evident anywhere. Anyone with more experience or more manuscripts should weigh in, but I'm wondering if a hidden slider or a wrap is what other people have also concluded. 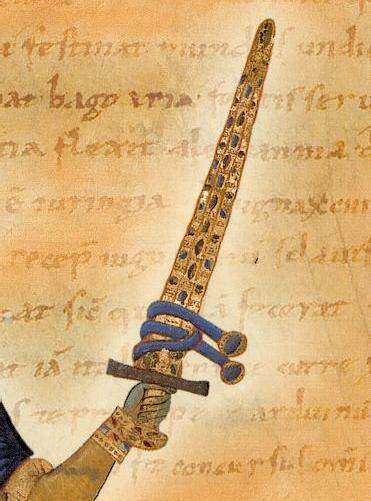 Green seems to be a fairly common color for scabbards, and blue or white seem to be the primary belt colors. Any thoughts? I've gone through most of the myArmoury threads on this stuff already, but if you have links, please post them! Here is the potentially bi-colored scabbard.